Not completely sold on the proportions/lines of this photo, but that’s one of the challenges of taking a photo with a dog in one hand next to morning traffic. 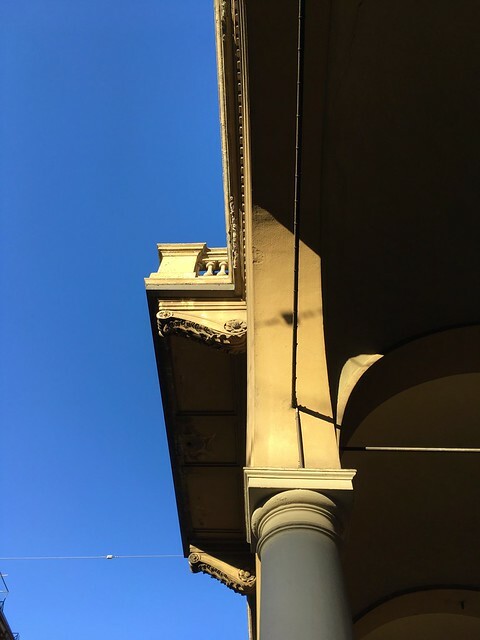 But I did love the morning sun on the balcony and the light and shadows of the portico arches, not to mention that blue blue sky. Something to try again in the future. And yes, I’ve been thinking of the quote from Romeo & Juliet and really, Verona isn’t that far from Bologna.